November 2015 – Reform in 5 Minutes! 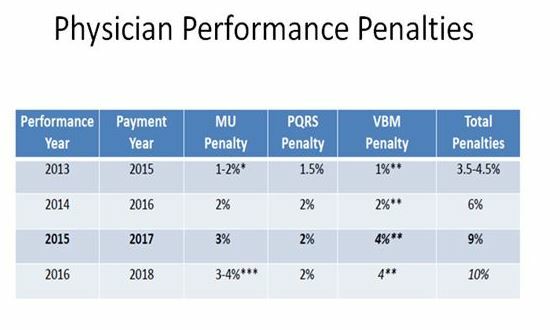 Performance penalties are already putting our Medicare payments at significant risk today. But you say, “It is just 2-3% so we decided to forego all that effort to keep from being penalized (EMR, reports, documentation, etc.). Besides, I just see one more patient per day which is easy with my paper chart, and I more than cover my penalties.” Time to think about this again. First of all, we are at risk of being penalized in 3 ways, each adding onto each other. Second, those penalties are increasing each year, and we are almost 3 years into it. And third, how we get paid/penalized for this year is determined by our performance 2 years ago! The performance of your practice this year will determine how you are paid in 2017. And these penalties could add up to 9% deductions already. The best way to understand it is graphically (see below). First, observe that there are 3 types of penalties. Then notice the performance year vs. the payment year. Last, look how the penalties add up! And many of us believe that penalties will continue to increase as a percentage of reimbursement. On a brighter note, top performers will be rewarded with higher reimbursement. However, unless you are submitting data to CMS, you could be the best physician in the country but you will be penalized. Furthermore, as CMS gets better at picking metrics, you will need to be ready to analyze your own data in order to improve any low performance metrics and cut costs. 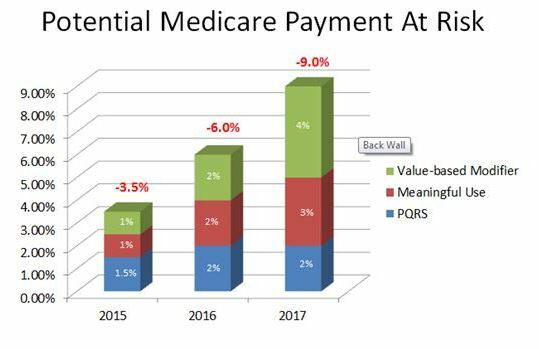 This will become critical the further we evolve with different payment methodologies (remember last week’s slide, moving from left to right, from fee-for-service to population health). The government’s goal is to shift some or most of the risk to the providers (hospitals & physicians) – how big the impact will be is not yet clear. It will depend on the success or failure of multiple pilot programs around the country with different payment methodologies. In a few short years, we must understand and control costs, not just in our own practice, but in the hospital system where we work. And we need to maintain the same quality outcomes at these lower costs, or otherwise accept big penalties. More to come in the future showing that this will eventually apply also to commercial insurance.